Designed specifically to fit the any weapon with this specific thread pattern to simulate the look of the Dragunov SVD / NDM-86 / PSL Style Weapons Platform. 3.939" Long MFI Dragunov SVD / NDM-86 Style Muzzle Brake / Barrel Extension for PSL / FPK .308 or 7.62 X 54R or any weapon with 14mm X 1.0 Pitch LEFT HAND thread. WARNING: Use only with .313 or smaller bullets. WARNING: The Exit Hole necks down to 0.348". Use only with .313 or smaller bullets. This particular MFI Muzzle Brake does NOT reduce the amount of flash discharged from the firearm compared to that of no muzzle device at all when fired. 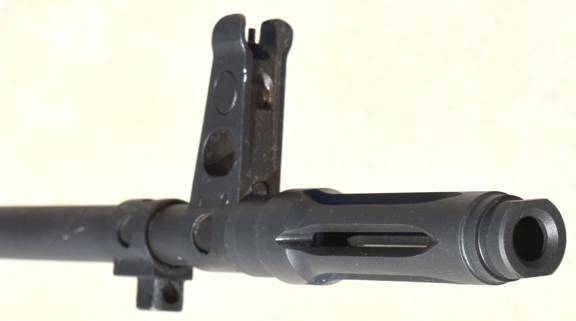 It does in fact redirect more of the flash in to the direct field of view than either no device at all or the standard muzzle device found on a PSL / FPK or similar AK47.This Muzzle Brake does not have a solid / filled in area at the bottom like our other CA DOJ Muzzle Brakes so it will be less effective in the down force than those other brakes, because the other brakes have 3 slots all facing upward to achieve maximum pressure downward as well as forcing all of the gas up into the field of view of the shooter. This particular MFI Muzzle Brake DOES IN FACT REDIRECT most of the flash that normally would be discharged forward from firearm's muzzle UPWARDS INTO THE SHOOTER'S FIELD OF VISION as there is a neck down in diameter of the exit hole which forces the flash / gases backward and out the slots in the top of the product. This particular MFI Muzzle Brake is SOLELY MARKETED as a "Muzzle Brake" which provides anti-recoil due to its physical characteristics. We have redesigned the original muzzle device of the Russian SVD and Chinese NDM-86 to not only fit the Romanian FPK / PSL WITHOUT any modification, but also to be a true Muzzle Brake as the front exit hole necks down to force gas backwards. The original SVD muzzle devices had no anti-recoil characteristics nor any flash suppression (according to BATF regs definition from 1995 per Underwriter's Lab') built into the weapon. We have addressed this issue and the anti-recoil / felt recoil is reduced by perhaps 25%. This Version of the MFI SVD Muzzle Brake is specifically made for the California and Maryland Markets to meet the California DOJ & MD minimum overall length of 30" or 29" for the PSL in . 7.62 X 54R and may or may not qualify as a Featureless Ca. Semiautomatic Rifle component. The CA DOJ refuses to rule on any device one way or the other, so it is up to you as to which one is best for your project. We do have other Muzzle Devices that are enclosed on the bottom and thus one more step closer to the letter of the new law. 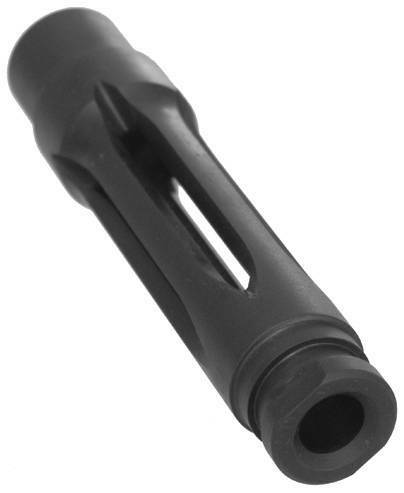 This item will fit ANY BARREL with a 14mm X 1.0 Pitch Left Hand Thread, the same as found on most AK-47s. Maximum Length: = 100.25mm or 3.939 inches. Maximum Barrel Extension : = 84.35mm or 3.320 inches. NOTE: Even though the overall length of this item is 3.939" part of that is the threads. As you can only count the threaded area once (threads in the product cover the threads on the barrel) so the total ADDED LENGTH to any weapons system's barrel would be about 3.320". This item fits any weapon with a 14mm X 1.0 Pitch Left Hand threads WITHOUT ANY MODIFICATION. You do however need to remove the existing Flash Suppressor / Flash Hider / Muzzle Device. So if you are looking at doing a "Featureless Rifle" using a MFI SVD Muzzle Brake may or may not be in 100% compliance with the Letter and Spirit of the law.